Public education in the United States faces an unprecedented crisis. The explosive growth of charter schools over the last two decades has shaken the status quo to its core. At stake are the future of public schools and how they will continue to educate our nation’s youth. ​Clashes over money and ideologies have led to a struggle between the public education establishment and those at the forefront of educational reform. The conflict is being waged in the court of public opinion, as well as in courtrooms throughout the country. While the outcome is impossible to predict, both sides are preparing for a fight of David versus Goliath proportions. Collaboration is critical to the success of both. • what every charter school parent needs to know to create and support an exceptional educational experience for his or her children. Mary Searcy Bixby, M.Ed, and Tom R. Davis, Ed.D, have spent their entire careers improving public education. Their professional lives have represented parallel trajectories: Mary in charter schools and Tom in traditional public education. Mary is widely recognized at the state, national, and international levels for her cutting-edge and bold educational reform leadership. Tom, with more than forty years of experience as a traditional public school leader, is a sought-after expert and serves as an executive coach to educational leaders. 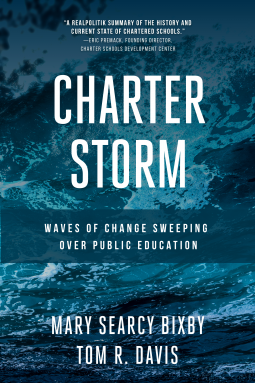 Over the last five years, the authors have researched and interviewed over 120 individuals comprising those at the forefront of charter and traditional public schools. They have also actively participated in the development and expansion of the charter school movement. There have been many concerns raised about education, on quality, structure, funding and the battle between private and public education. I wanted to read this book because I was interested in learning about charter schools and the status of education reforms in America. This book gives an insight into various communities and the challenges they face. See, unlike my country-Kenya, America has different laws for each state and what's key about all the states is that under the constitution, education is a right and as such there's a lot to be said on public education. Anyone interested in charter schools, public education and whether the reforms are disrupting the current public education system in America would enjoy this book! Thank you NetGalley for the eARC, a well researched work right here!